Jack Doyle, who caught a touchdown pass Sunday against Miami, is out for the season with a kidney injury. INDIANAPOLIS — Andrew Luck might be playing the best football of his career. But he’ll still need help reaching the playoffs with mounting injuries threatening to derail the Indianapolis Colts‘ late postseason push. The team provided no immediate update during Tuesday’s availability on whether Doyle had been released from the hospital. The adaptations start with Ebron, the lone remaining healthy tight end among the five listed on last week’s depth chart. He’s already caught 11 touchdown passes this season, matching his previous four-year total and tying Dallas Clark’s single-season franchise record by a tight end, and has played the way Detroit envisioned when it made Ebron a first-round draft pick in 2014. Kelly’s status for this week is still to be determined, though he said Tuesday he felt much better and was running on the treadmill. But losing Doyle might be most damaging for Indy. He followed his first Pro Bowl selection with 26 receptions for 245 yards and two touchdowns in six games. 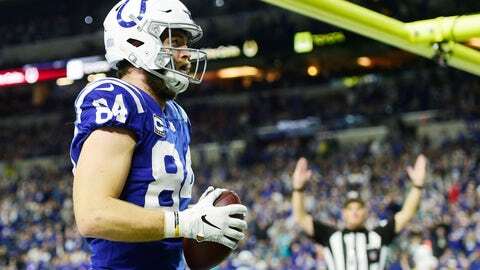 The Colts went 1-4 when he missed five games earlier this season with a bad hip, and they had won all four since his Week 8 return against Oakland.